There is something very intriguing about the way street artist Ernest Zacharevic manipulates a household image in a subversive way. Snow White is on the wall, but she’s looking a more worn out than we’re used to seeing her. WHO: Ernest Zacharevic travels the world looking for ways to engage with his surroundings. In Malaysia, he incorporated an old bicycle onto a city wall. He then painted school children riding it. His work is fantastical but also highly technical. Zacharevic utilizes props in interesting ways so that the walls are actively engaging passersby. WHAT: Snow White and her seven dwarves are often depicted in the forest in a frolicky and fun manner (well, except for the part about the spell and the Queen and the comatose maiden). Here they are, but looking haggard and world-weary. 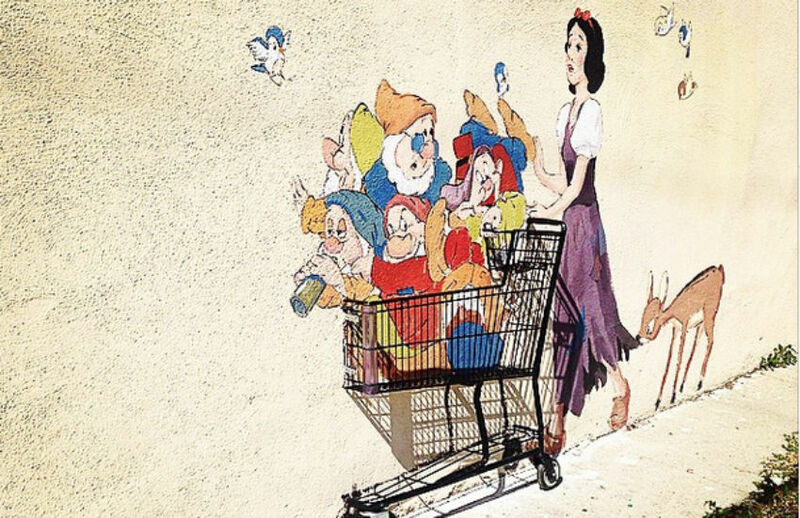 Snow White pushes all of the dwarves in an actual shopping cart (a Zacharevic trick). Her dress is torn and she looks forlorn. Maybe happily ever after doesn’t even exist in fairy tales. Thanks to the assistance of Branded Arts, this stretch of La Cienega Place has been given a great deal of love. If you’re driving south on La Cienega and you’ve just crossed Venice, veer right and you will find yourself on La Cienega Place. The mural is on the right hand side. If you’ve hit Washington, you’ve gone too far.